Harbor Sweets of historic Salem, Massachusetts has been handcrafting fine chocolate in copper kettles using fresh butter, cream and wooden paddles since 1973. 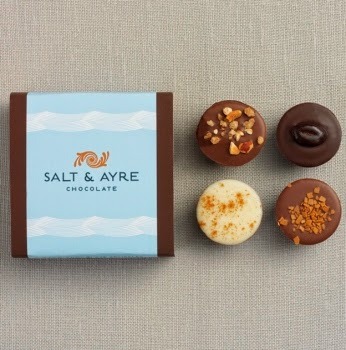 To celebrate their 40th anniversary, the celebrated New England chocolatier has collaborated with Lora Brody, The New England Table, and Chocolate American Style, cookbook author in creating Salt & Ayre, a collection of very handsomely packaged, luxury truffles wrapped in 70% dark. The flavors include Chai, Cafe Au Lait, Toasted Hazelnut, and Espresso.